There are many different traits of talented web designers. I will just cover a few of them in this post. 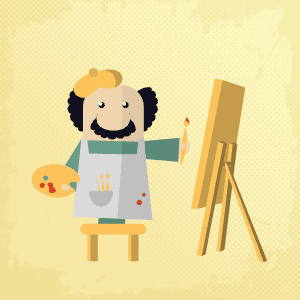 Talented web designers need to be highly creative and artistically inclined. They need to appreciate good design practices, artistic composition and aesthetic visual composition. If you can get one to work with, a creative web designer that can make a good looking, well functioning website, you really have a good thing going. And by “creative” I don’t just mean they can create beautiful websites. I also mean they can solve problems. Many times, when developing a website, one will have problems that need to be solved. Creative web designers are able to look at these “problems” and find a good solution. They don’t just scrap things together and hope that it works. A good designer will develop a creative solution for the problem that looks great and functions properly. A good web designer is also curious. They take the time to talk to the client and ask what they need. They find out what the client wants, what their hopes and expectations are, and what kind of functionality they desire on their website. They take all of this information and come up with an elegant solution to incorporate all of these desires of the client. When talking about the traits of talented web designers, we can’t forget the fact that a good web designer needs to be skilled. They need to know how to design a website. They need to stay on top of the latest industry standards. They need to know how to use the latest version of the software they like. Technology is changing all the time. A good web designer will stay on top of these changes as they come. Finally, a good designer needs to care about their work. For a good designer, creating a website is not just a job. It is a work of art. It is a great idea to find a designer who is passionate about what they do, who “gets” your vision and is excited to help you make that vision come true by creating a wonderful website for your business. These are just a few of the traits of talented web designers. Contact us today to see how creative, curious and skilled we are and how much we care about building the perfect website for you and your business.